Suzuki Hayabusa wohoo. The world’s fastest ever sports bike designed for street racing.Every young heart is just mad for it and no one can deny this statement that he is not.The feeling of getting on a bike like this cannot be defined by words actually it has no definition.What if you get a Suzuki Hayabusa White Motorcycle Jacket for your bike which will make you look the guy who just have power to catchÂ and seeks every third person’s eye balls in just one entrance look without any hesitation.What if you get that thing which performs a work of magnet towards your body.So the desires are here friends we famous movie jackets proudly presents you the above shown Suzuki Hayabusa Motorcycle Jacket in a total sound price which will be affordable for you too.Its not cheap looking its not funky in look its just a perfect decent cloth made of Round neck slightly V neck collar ,YKK zipper straight closure in front and in pure shiny white color.Get it now!! hi guys! 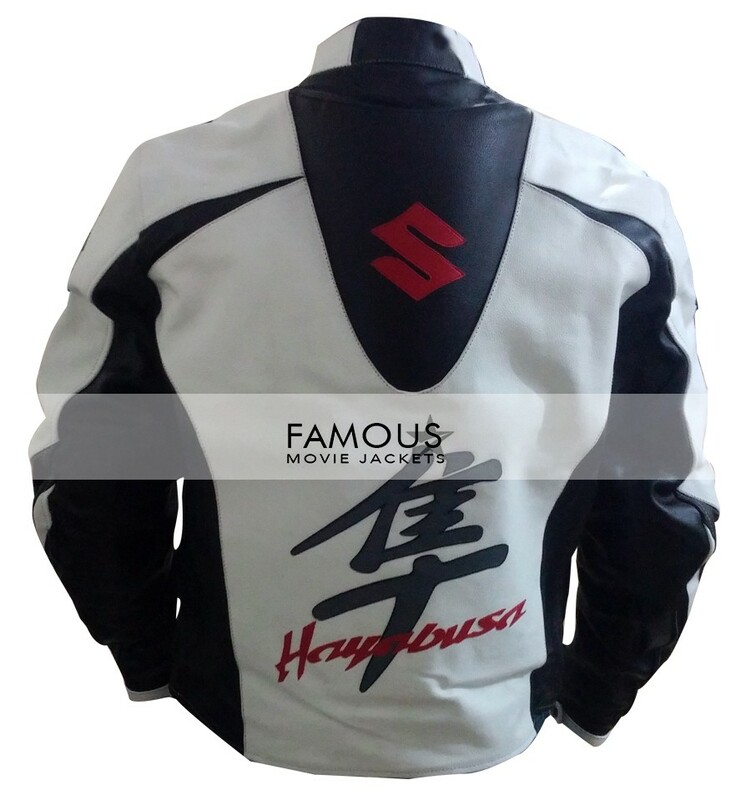 i am here to say thanks to you guys to deliver me such a great leather jacket, i am mad for racing and have 3 sports bikes that have superb speed, Now this Hayabusa Jacket make my collection better and now i always wear this jacket when i go to race on my suzuki bike. i got the my order yesterday i am very happy to find a receive a great piece of leather, i refer my friends last to buy jackets from here, just because of quality and costumer service. 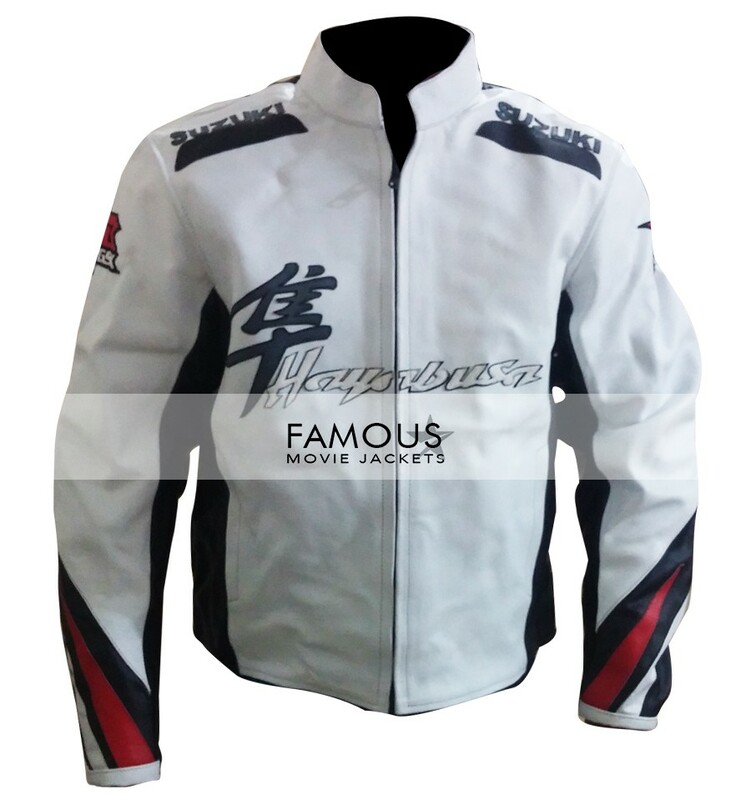 excellent quality jacket at a very low price, look exactly the image above, brought it for my boyfriend he love racing and he has Suzuki Hayabusa, so its perfect gift to him, thanks to famous movie jackets to give my order on time. 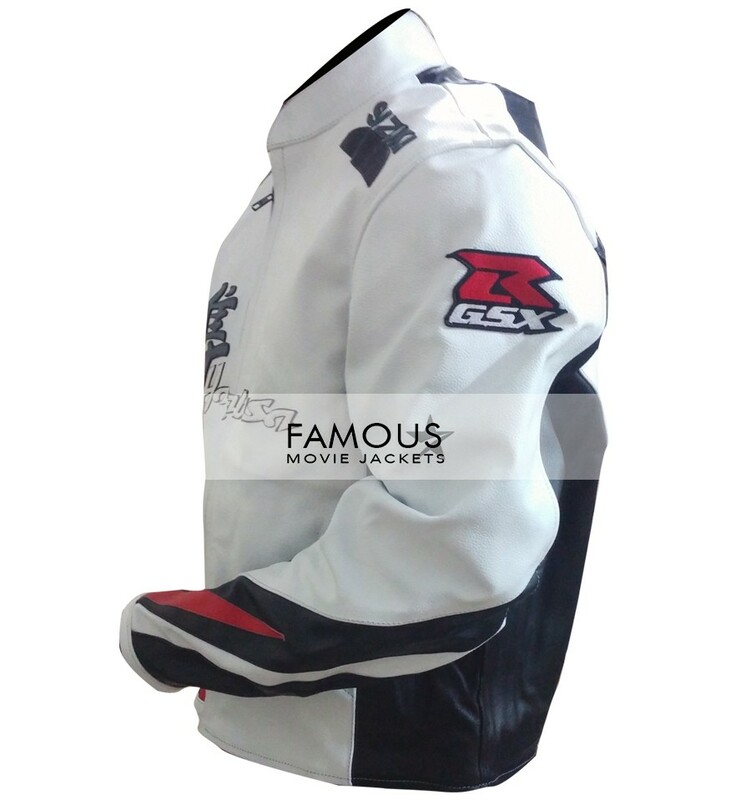 its has been great experience with famous movie, i got my delivery and its exactly look like the image here, material and design is very cool and i make no wrong decision for buying it. I love its slim fit and authentic design because when I wore it last night in a party all my friends were surprised and this jacket made me really look good yesterday. 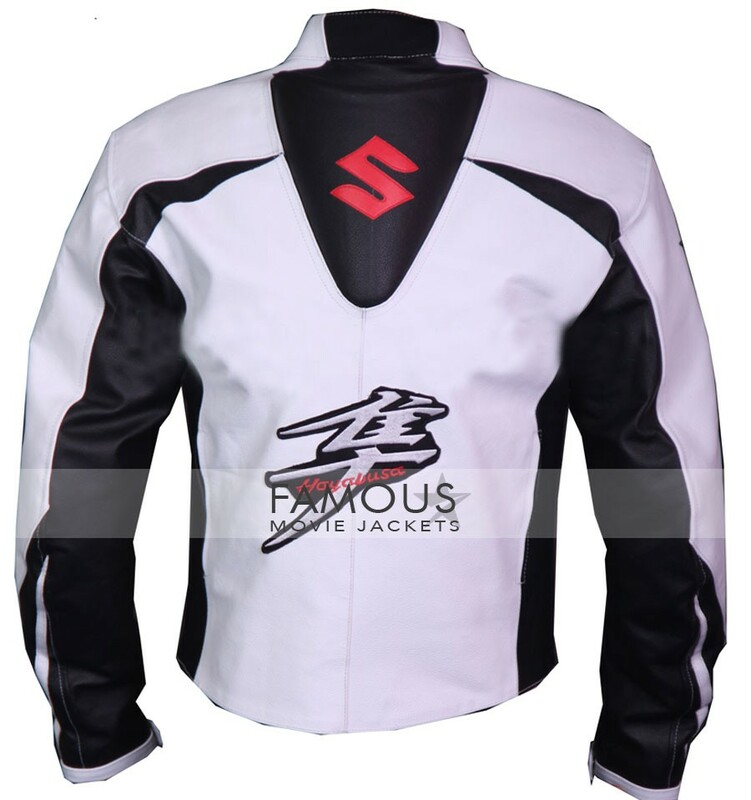 on 5th of this month i have race on desert with my friends we all excited and for this race i brought this suzuki jacket and ready my rx-8 with proper manner, its heavy as my expectation and extra padding is perfect and suitable on my body with perfection. when i received my parcel i was totally shock it’s extra fitted on my waist and chest length and arm fitting is good but other things is not leather material not doubt very good. i saw your size chart what i order it’s perfectly according to the same measurement i don’t what the real matter. 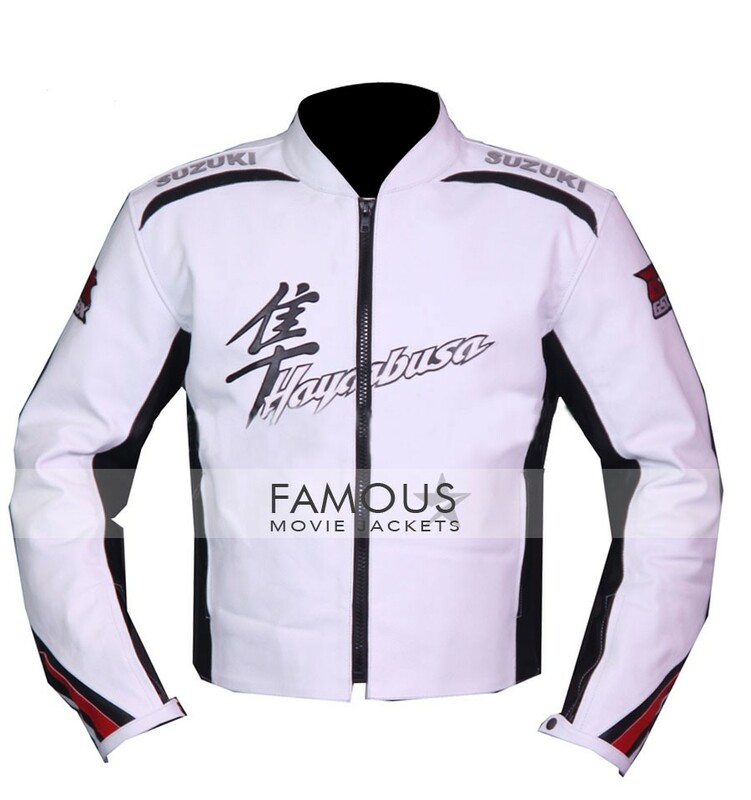 the most important thing is in this jacket is the hayabusa design at front i love this much all the design and front looks is good i think to buy it in black color too what will the color combination if the base color is black.